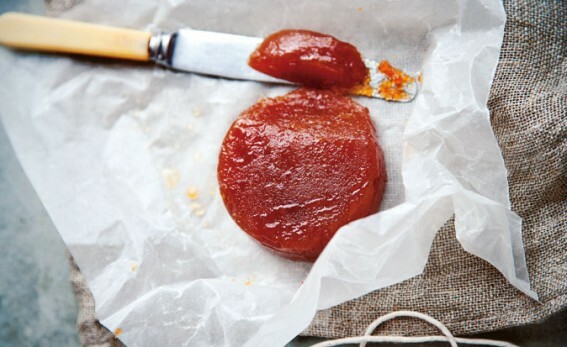 Membrillo, or quince cheese, requires some patience but it is so worth it. You can now buy it in delis and some supermarkets, where you will find it called by its Spanish name. Wash the quinces, removing the little black bit at the base and rubbing off any downy covering. Chop them and put them in a heavy-based saucepan or preserving pan with enough water to cover. Bring to a simmer and cook until completely soft and pulpy. It will take about 25 minutes. Push the pulp through a nylon sieve into a clean bowl. When you have sieved it all, measure it. Put the purée into a heavy-based pan and, for every 450ml (16fl oz) of purée add 450g (1lb) of sugar. Bring very gently to a boil, stirring until the sugar has dissolved. Simmer very gently for 1–1½ hours until it is really thick; be careful as it can spit like a volcano. You need it to be so thick that, when you scrape your spoon across the bottom of the pan, it leaves a clear channel before closing up again. It also starts to come away from the sides of the pan as you stir, forming a thick mass. If you want to give the membrillo as a present, or want your moulds back, you can unmould it and wrap in greaseproof paper or baking parchment, then tie with string. Properly wrapped, it keeps for a year in the cupboard or refrigerator. I find it stays moister in the refrigerator, but gets a bit sticky.